Iberdrola, GDF Suez and Scottish and Southern Energy (SSE) have announced the formal launch of their joint venture for nuclear new-build in the UK. The new joint venture company, NuGeneration Ltd (NuGen), aims to develop a nuclear power station of up to 3.6GWe generating capacity, on land near Sellafield in Cumbria. The consortium acquired an option on the site in October 2009. NuGen is now preparing detailed plans for development of the site, and intends to make a final investment decision around 2015. Any new power station would then be commissioned around 2023. The joint venture company is headed by Olivier Carret (previously at GDF Suez) as chief operating director, and Alfio Vidal (previously at Iberdrola) as chief nuclear director. Vidal commented: “NuGen’s greatest strength is that it can draw upon the experience, resources and skills of three well established and respected energy companies, that have experience of operating and delivering nuclear, and other generation plants, across Europe. The three consortium partners currently own and operate around 10GW of nuclear capacity in Spain, Belgium, Germany and France. GDF Suez and Iberdrola each hold 37.5 per cent of NuGen, while SSE holds 25 per cent. Her Majesty The Queen, accompanied by HRH The Duke of Edinburgh, officially launched building work on the new Nuclear Advanced Manufacturing Research Centre (Nuclear AMRC), during a visit to the University of Sheffield AMRC with Boeing today (18 November 2010). 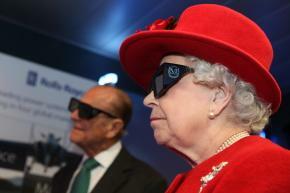 Her Majesty donned a set of virtual reality glasses to remotely activate a digger from inside the AMRC’s MANTRA (Manufacturing Transporter). MANTRA is a customised lorry and trailer designed to give aspiring young engineers a hands-on experience with state-of-the-art manufacturing technologies, including a 3D virtual reality system used for product design, simulation and training. The Nuclear AMRC is a new collaboration between the University of Sheffield and the University of Manchester, with the backing of the Government and leading companies involved in building the new generation of civil nuclear power stations. Based on the same collaborative model as the AMRC, the Nuclear AMRC will help UK companies become global leaders in the production of components and systems for the new generation of nuclear power stations. The Nuclear AMRC building will sit alongside the established AMRC Factory of the Future, on the Advanced Manufacturing Park in South Yorkshire. A former colliery site, the Advanced Manufacturing Park is now a national hub for high-technology manufacturing businesses. During their visit, Her Majesty The Queen and The Duke of Edinburgh toured the facilities of the AMRC Factory of the Future, and viewed research projects that AMRC researchers are leading for partner companies including Boeing, BAE Systems and Rolls-Royce. 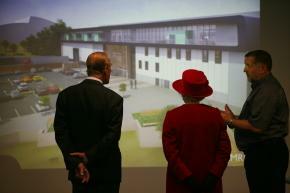 Her Majesty also met AMRC apprentices, who talked about how they are benefiting from the apprenticeship programme. The Nuclear AMRC will incorporate 8000 sq m of factory-scale research facilities, laboratories, and office and meeting space. The landmark building is designed by Bond Bryan Architects, and scheduled for completion in Autumn 2011. The manufacturing research facilities in South Yorkshire will be complemented by expanded research laboratories at the University of Manchester. Other major new developments at the AMRC include a Knowledge Transfer Centre to provide businesses with training in new manufacturing technologies; and a Composite Centre extension to the Factory of the Future. During their visit to Sheffield, The Queen and The Duke of Edinburgh also opened the new Sheffield Institute for Translational Neuroscience (SITraN), and visited a showcase of projects led by the University of Sheffield’s SheffieldVolunteering at Sheffield Cathedral.